Navagraha stotram is one of the most effective stotrams. Regular reciting of the stotram will reduce the planetary affects on an individual to a great extent. As per Hinduism and Vedic astrology Sun is believed to be the first God or Adi (first) Narayana and is considered as one of the Navagrahas (nine planets). 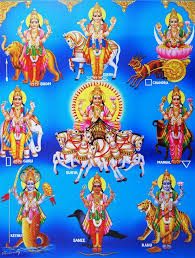 The other 8 planets as per Hinduism are Soma (Moon), Mangal (Mars), Budh (Mercury), Guru (Jupiter), Sukra (Venus), Sani (Saturn) are the planets while the other two Rahu and Ketu though are considered as planets as per Vedic astrology / Hinduism, these are actually the chayya grahas or the shadows. These planets exert gravitational pull on one another and have their influence on the life of the people on Earth. Accordingly, people have ups and downs in their life. For a peaceful and blissful life, reciting the stotram will serve the purpose. The auspicious day of Ratha Sapthami which is celebrated on the 7th day after Amavasya in the Hindu month of Magha, is dedicated to Sun god. Meaning: The one who is red like a Hibiscus flower (japakusuma), the son of Kashyapa rishi the one who shines bright and radiantly and the destroyer of darkness and all sins (tamorim sarva papaghnam), salutations (pranatosmi) to Diwakara (Sun). The one who is born to Simhika, bow to Rahu. Meaning: The one who shines like the palash flower (Flame of the Forest), the foremost of the planets. The one who is fearful and with full of anger, bow to Ketu.